Thanks Ralph, Paul, Leo, Peter and others who contributed. There are of course many people who contributed to the development and success of MS Help in all it's shapes and forms. Here are some MS Help people we were fortunate enough to interacted with as help MVPs. Ralph Walden - joined Microsoft in 1987 and wrote a help system for MS DOS called QuickHelp. 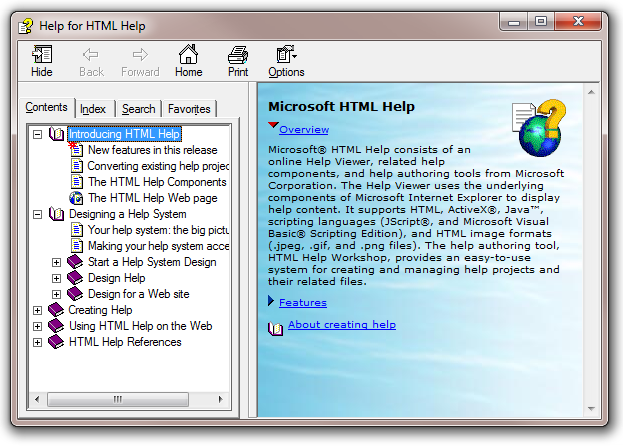 In 1992, he took over the development of WinHelp, producing WinHelp 4.0. In 1996 he was system architect for HTML Help 1.x. Ralph left MS early 1998 about the time MS shipped HH 1.1 for MSDN help collections (Visual Studio 6.0 help). Ralph then formed KeyWorks with Help MVP Cheryl Lockett Zubak of Work Write, Inc.
Shane McRoberts - joined Microsoft mid 1998. He was formally R&D manager for Blue Sky Software Corp, Help Tools Division. Shane picked up where Ralph left off, as lead PM (Program Manager) for the HH 1.x dev team. Shane then headed up the Help 2.x dev team which evolved the MSDN help platform in robustness and provided much needed features such as Unicode support. In the lead up to Vista Shane lead the AP Help team (Help for Vista). The AP Help code was based on MS Help 2.x C++ code. Last thing we heard Shane was working with the MS Share-Point server team, then the Zune team. April Reagan - joined Microsoft developer division June 1998, but had worked as a contractor with MS before that. After working with Visual C++ group she joined the User Education group in 2006 and started to look into ways to improve the developer Help experience. Late 2007, early 2008 April got the green light to start a brand new help team with the aim of completely replacing the MSDN/VS help engine (MS Help 2.x) for VS 2010. Paul O'Rear - joined Microsoft developer division 2002. Previously a Microsoft Help MVP Paul (1999-2002) and prior to that a freelance developer and expert in WinHelp as well as other MS Help technologies. Paul progressed through the ranks to become a PM on the Help Viewer team taking over much of April Reagans work and seeing both VS 2010 and VS 2012 help to market. As Microsoft becomes increasingly less interested in being involved with the help authoring community, we are grateful to have such a strong advocate for help & community within Microsoft. Paul continues to work behind the scenes to support the help world. Inside and outside Microsoft Paul certainly earns his title of "The Help Guy". Leo Notenboom - joined Microsoft in 1983 and worked their until 2001. Leo designed and implemented the "Microsoft Advisor Help Engine" which was used in many of Microsoft's DOS based applications. Leo's techniques to compress and quickly decompress help text, were awarded two U.S. Patents (4,955,066 and 5,109,433). Leo lead the WinHelp 3.0 and Mediaview teams. Ralph Walden on Leo: QuickHelp was the standalone help system built on top of MS Advisor, and QuickC and Programmer's Workbench also had help systems built around that. It's possible that the character-based version of Word at that time may also have built a help system around the Advisor layout engine. Leo then went on to head up the WinHelp team, and created version 3.0 and 3.1 before moving on to head up the Mediaview team. That was his last involvement of help -- or at least it was the last released help product he worked on (he actually worked on a new help system that was canceled before he went to a different area of the company). Floyd Rogers - Floyd joined Microsoft in July 1982 and working there for 14 years until July of 1996. Floyd created the first version of WinHelp. He is responsible for WinHelp's layout engine which has remained virtually unchanged for the last 21 years. Ralph Walden on Floyd: My own opinion is that it was a rather brilliant piece of coding since it had to run in extremely low memory situation (operating system and application(s) typically only had 640k of memory, if that much). He started development of WinHelp in 1987. 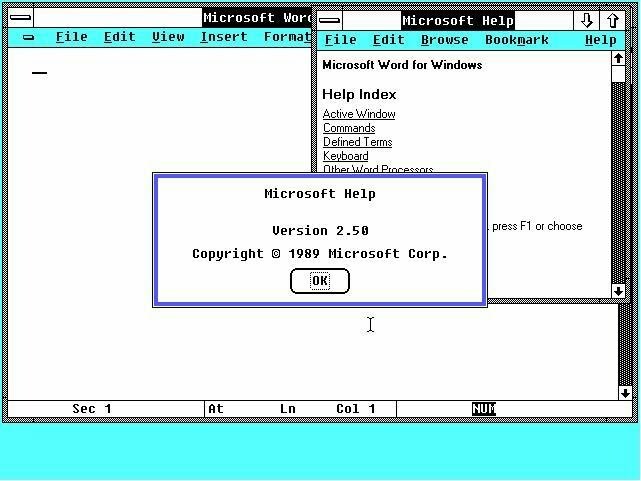 I never ran Windows 2.0, but I would have expected that first version of WinHelp to have been released with either Windows 2.0, or with the Windows 2.1. Peter Plamondon - Peter joined Microsoft in November 1994 and working there for 10 years, until July 2004, as Group Manager, Technical Evangelism, Partner Relationships. Thankfully for the MVPs he was the glue between the MS Help team and MVPs and protected us from the internal politics of the day. Peter was responsible for relationships between the MS Help and the help community by starting the Help MVP program and promoting Microsoft Help at the WinWriters and Help University conferences. Peter recalls: Those were interesting times. My part of the browser war consisted of explaining to my manager, Morris Beton, the threat to the Windows platform if NetHelp established itself as the de facto help format, and said with $100k I would guarantee that wouldn’t happen. He said I could have the $100k, provided he didn’t have to spend any cycles at all thinking about or dealing with help, so the next thing he heard about it would be me telling him we’d won, which I agreed to. That was probably in 1998, which I think is when I started sponsoring the help conferences, and spun up the Help MVP program, and helped Wexler get his MS Press book deal, and organizing Help Summits for help authoring tool vendors so their heads would be filled with questions and ideas about working with HTML Help rather than NetHelp, and making sure Ralph and Kate were keen to help the vendors do that (which wasn’t hard, I got the impression they enjoyed working with vendors and the community more than their day jobs). Also: The first HTML Help MVP program was an unsanctioned, rogue undertaking that the official MS MVP program folks were unaware of - because I couldn't track down the official folks before I needed to announce the initial HTML Help MVP awards. Dana Cline pointed me to the Help MVP contact (actually for the Windows SDK MVPs, I believe), and eventually it became clear we should fold my rogue operation into the official program, so the HTML Help MVPs would get all the official benefits. The only requirement - I had to serve as the MVP Lead, as the other leads didn't have the bandwidth. Paul O'Rear took over as MVP lead after he joined Microsoft. Sageline Interview with Peter Plamondon - July 1996. A behind the scenes look at Microsoft HTML Help. Sageline Interview with Peter Plamondon (#2) - Nov 1996. Follow up interview with Peter. Sageline Interview with Joe Welinske (WinWriters) - WinWriters conferences were (and still are) the focal point of the help community. Sageline-Blog - Some of Bill's 1996 Help blogs. Ralph Walden wrote QuickHelp in 1987 for OS/2 and was later ported it to MS DOS. 1987 - QuickHelp : Help system for OS/2 and MS-DOS. Character based help (pre-Windows). Author's worked with RTF source files and BMP images. However this authored source is stored in the help in WinHelp's own proprietary format. WinHelp 2.x did not ship with an Operating System. 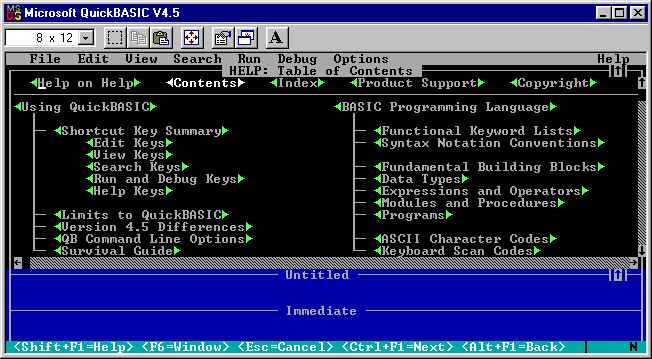 It shipped with early version of Word and Excel. 1990 - WinHelp 3.0: WinHelp 3.0 ships with Windows 3.0 released May 1990. 1992 - WinHelp 3.1: WinHelp 3.1 ships with Windows 3.1 released in March 1992. 1995 - WinHelp 95: WinHelp 4.0 is shipped with Windows 95 / Windows NT 3.51. 2006 - WinHelp Deprecated: In March MS announce that WinHelp will be actively phased out (It's old code and not secure). 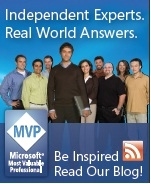 Ginger Glostein [MSFT] told MVPs that her dev team would shore up a version of WinHelp for Vista. This version would have macros disabled by default and would be available for Vista by download only - See KB917607 (WinHelp for Vista). Authors work with web type source files (HTML, JPG, GIF etc). Internal format is proprietary, however the authors source files (HTML + Images etc) can be retreaved (almost round-trip) by using the appropriate MS API calls. I say almost round-trip because the HTML no longer has any embedded Keywords (those embedded using <object..> statements). 1996 - HTML Help Announced: Ralph Walden announces MS plans to stop development on WinHelp and start development on HTML Help. The announcement was made at WinWriters Conference, Feb 1996 at Seattle, WA, USA. 1997 - HH 1.0 Ships: HH 1.0 is shipped with IE4. MS also use HTML Help to create Help collections for MSDN and MS VStudio 6 help. MS have never published the documentation for HH Collections. 1998 - HH 1.1 Ships: HH 1.1 ships with Windows 98 (June 98), then with MSDN & Visual Studio 6.0 (June 98). 1999 - HH 1.21 Ships: HH 1.21 ships with IE5 + Office 2000 + Win98 SE (April 1999). 2000 - HH 1.3 Ships: HH 1.3 ships with Windows 2000 (Jan 2000). About this time HH 1.x is now part of the Windows OS. Users can no longer update HH runtime except via official MS hotfixes and service packs. 2002 - HH 1.4 Ships: HH 1.4 ships with Windows XP SP1 and IE6 SP1. By this stage HH development has stopped and is now in maintainance mode. 2004-05 - Security Updates: Difficult years for Microsoft as they redefined the way they developed code in the face of constant Windows security attacks. The Help team released several major security updates for HTML Help that limited CHM help files to work on the local PC only. 2001 - MS Help 2.0 Announced: Help 2 (codename Havana) was announced at the 2001 WinWriters Conference. 2002 - MS Help 2.0 Ships: The H2 run-time shipped with MSDN and Visual Studio 7.0 (VS .NET) February 13, 2002. The H2 Compiler/SDK (VSHIK) shipped April 2002. Announced as the next help for the masses, MS later reneged and so H2 remains the help engine for MSDN / Visual Studio (7.0, 7.1, 8.0, 9.0 - AKA VS 2002, VS 2003, VS 2005, VS 2008). 2007 - MS Office 2007: MS Help 2.x ships as the help engine for Office 2007 local help. 2004 AP Help Announced: Assistance Platform Help first announced at Writers UA conference Mar 2004. 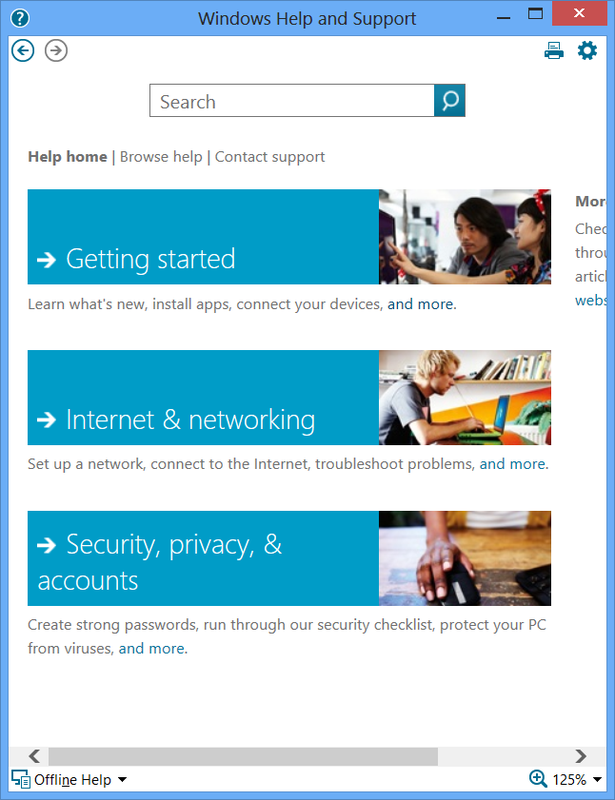 AP help is a slightly modified version of MS Help 2.x. 2007 AP Help Ships: Assistance Platform help ships with Windows Vista November 2007. Announced as the next help for the masses, MS again changed their mind. AP help remains the core help system for Vista. 2008 Jan - MS Help 3.0 Announced: Late 2007 April Regan gets the go ahead to form a new help team and rewrite MSDN help engine. 2008 is a year of recruiting new team members and investigation. This info was announced through April's WebLog. 2009 July - April moves to surface group. Paul O'Rear joins the help team. There is no documentation so Rob Chandler [MVP] documents help 3 so that VS help integrators can start migrating (later renamed to MS Help Viewer). 2010 April - VS 2010 (and MS Help Viewer 1.0) RTM: Help Viewer is out the door but poorly received, because a) It's in a browser and b) There is no Index c) no full TOC d) no way to save favourites. The users are very vocal, Microsoft listen and announce they are working on a standalone viewer. 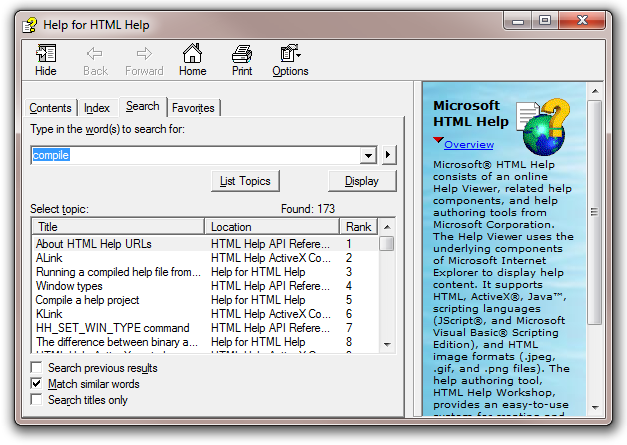 Rob Chandler [Helpware\Help MVP] releases H3Viewer (interim replacement viewer with full TOC, Index and bookmarks). Rob also partners with Microsoft (specifically Paul O'Rear [MSFT]) to produce mshcMigrate a free help migration tool for VS help integrators. Other vendors are now coming on board to support Help Viewer 1.0. 2011 March - VS 2010 SP1 (and MS Help Viewer 1.1): After receiving much passionate feedback over help in a browser, Microsoft have released a more traditional standalone help viewer application. Featuring a full TOC, full index, bookmark saving. This seems to address most of the complaints, although one glaring absence is the ability to filter (scope down the TOC/Index/Search). Help ships with both VS 2012 and Windows 8 OS. Both have the same help help engine but ship different DLLs (renamed to keep the system separate). Here the .mshc help file is the same as HV 1.0 but the help engine has been rewritten -- No more Help Agent tray application and now has the familiar COM API interface. Both VS 2012 and Win 8 help ship with different viewers. The VS 2012 viewer is very advanced (feature rich) compared to the Win 8 viewer. This table had its origins in a presentation by Paul O'Rear to the Help MVPs (2007 MVP Summit). Originally written for OS/2, then later ported to MS DOS. Paul O'Rear (MVP Lead) + Single Help MVP group. 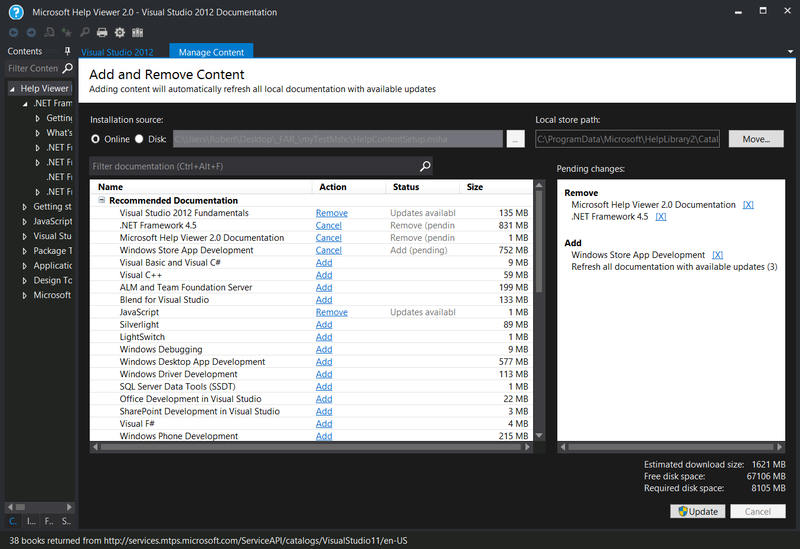 2010 MS Help Viewer 1.0 ships with VS 2010 RTM MS HV 1.0 is finally out. Many people are responsible. See VS 2010 Help Team below. April had moved on to the surface team in July 2009 and Paul O'Rear joined the help team. 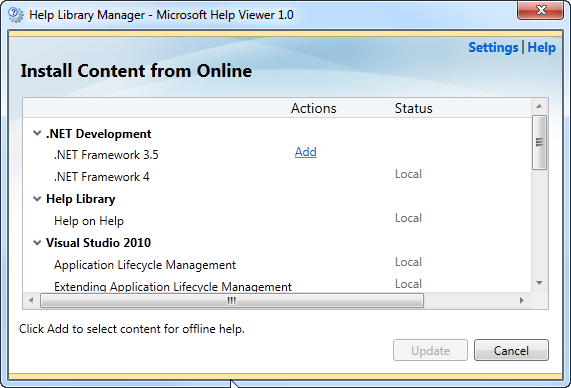 2011 MS Help Viewer 1.1 ships with VS 2010 SP1 Mostly the same people responsible for the new new standalone help viewer. Ryan & Sheridan have moved on. 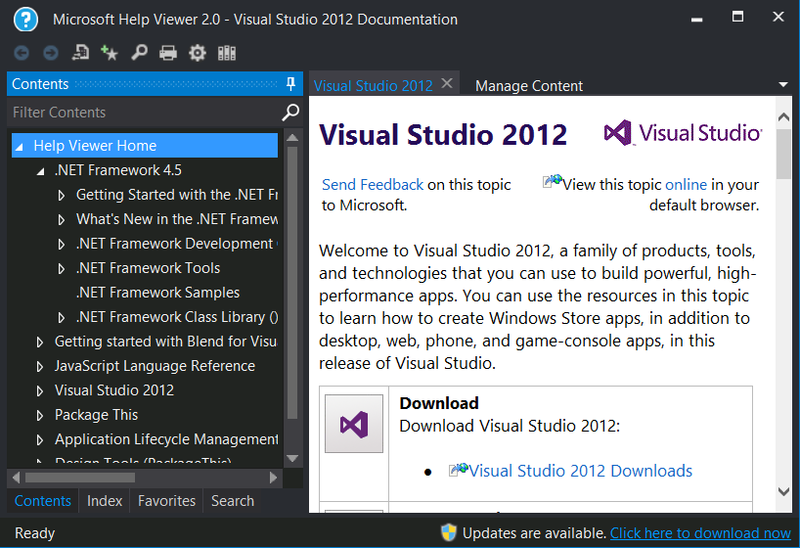 2012 MS Help Viewer 2.0 ships with VS 2012 (VS11) and Windows 8. VS/MSDN help team The runtime DLLs for VS11 & Win 8 help are the same but renamed. MMV = Multimedia Viewer was an early attempt at incorporating rich media (Images/Video) into rich content based applications - largely for CD distribution. 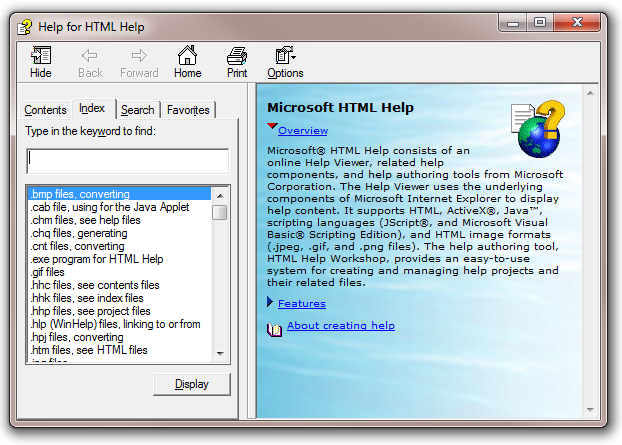 It had all the features of WinHelp and largely the same codebase, but supported several unique features as well, including multiple panes in Windows, multiple visible indexes and full-text search. Many of the features of MMV were integrated into WinHelp 4.0 for Windows 95, largely making MMV obsolete. MV = MediaView was an abstraction of all the rich content features of both WinHelp and Multimedia Viewer that was essentially a Software Development Kit allowing developers to design and implement their own content applications, with their own rich UI designs and other features. The kit allowed for developers to target the Macintosh platform as well! MSN (Blackbird) was originally designed using MediaView technology allowing for content applications to interact with online services. InfoTech = The file subsystem for WinHelp, MMV and MV was ultimately owned by the InfoTech team at Microsoft and became the foundation for HTML Help 1.x, MS Help 2.x, AP 1.0 (Vista Help) and Office 2007 Help. LH 1.0 = Longhorn Help (written in .NET C#) never saw the light of day. The release date for Vista was pushed forward, and Jim Allchin decided there would be no .NET code in Vista. The result was the need to create a new help system in short order using existing code. MS Help 2.0 was modified and released as AP 1.0 (Vista Help). And many other people. Like in most organisations people move around - April & Ryan have moved to other groups. And many other people. Like in most organisations people move around. It's helpful to step back, and look back at Microsoft product releases. For full history see sites such as TackTech.com and Wikipedia. The tradename "Microsoft" is registered. MS-DOS 1.0 shipped with the new IBM Personal Computer. Microsoft Windows was announced. Rowland Hanson (head of MS marketing) suggests the name Windows would be better than Interface Manager. IBM-Microsoft sign the joint development agreement. OS/2, code-named "CP/DOS", took two years for the first product to be delivered. Windows 1.0 ships. Windows are tiled, rather than overlap, since Apple Mac own that feature. Windows 2.0 ships. 1 MB memory max. Windows now overlap and Apple Mac files a suit against MS and HP. 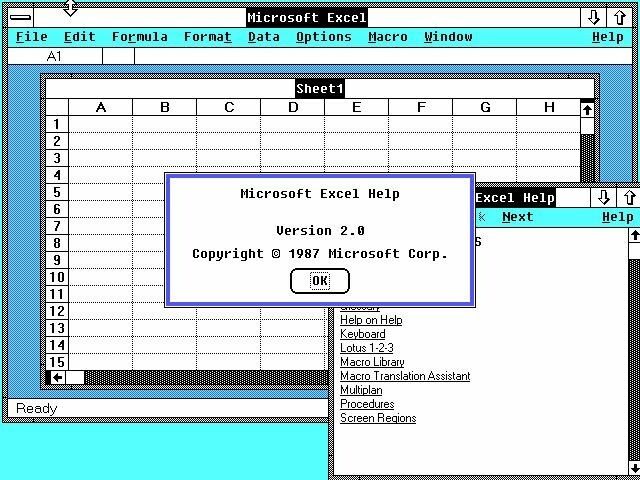 The first Windows versions of MS Word and MS Excel ran on Windows 2.0. More 3rd party developer support. WinHelp 1.x and WinHelp 2.x shipped with early versions of WinWord and Excel. MS OS/2 announced, as part of a joint agreement between Microsoft and IBM. OS/2 1.0 ships. IBM-Microsoft joint development; 16-bit protected mode OS; Required 80286, about 1.5MB RAM; Text mode interface only; Single DOS box support; FAT file system only. Windows/286 2.1 ships. Supports HMA (High Memory Access). Supports new features of the Intel 80286 processor. Windows/386 2.1 ships. Supports new features of Intel 80386 processor. NT Starts - David Cutler, formerly of Digital and now working for Microsoft, begins work on Windows NT. MS-DOS 5.0 shipped. Featured a retail upgrade. OS/2 1.2 ships. HPFS file system an improvement over FAT. Dual Boot to Windows. Windows 3.0 ships. Much improved. Very popular - 10 million copies sold. Virtual memory improves multitasking. 386 Enhanced mode allows running of 32bit software. MS drops OS/2 - Windows 3.0 becomes more popular and the IBM-Microsoft relationship breaks down and is eventually dissolved. IBM continues to develop OS/2 while Microsoft's unrealized OS/2 3.0 becomes Windows NT. Both companies have access to the OS/2 and Windows code base. Windows 3.0 with Multimedia Extensions ships. CD-ROM and sound card becoming popular. Windows 3.1 ships. Now a 32bit OS but can still run 16bit applications. MS-DOS 6.0 upgrade shipped. This version included DoubleSpace. Windows for Workgroups 3.11 shipped. Windows NT 4.0 shipped. Contains IE2.0. Visual Studio in 1997 shipped. 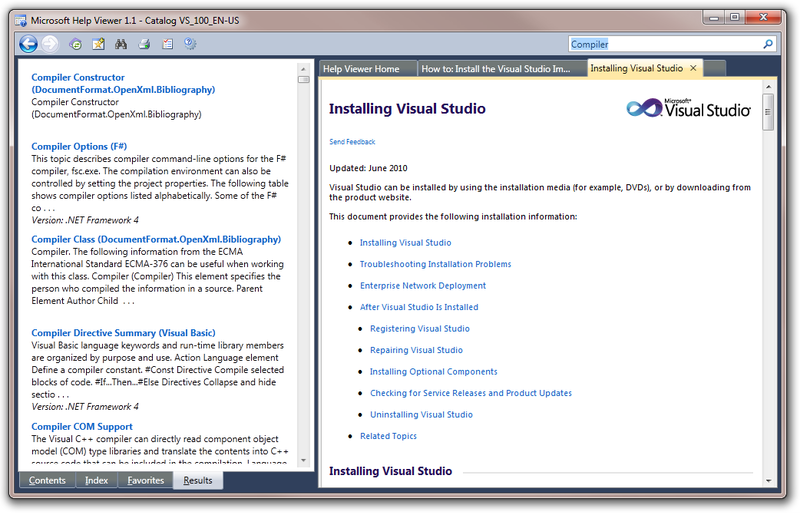 Brings together Visual Basic 5.0, Visual C++ 5.0, J++, Visual InterDev , MSDN Library. MSDN help engine is a special version of HTML Help not documented for public use. Includes HTML Help 1.1 + IE 4.0. 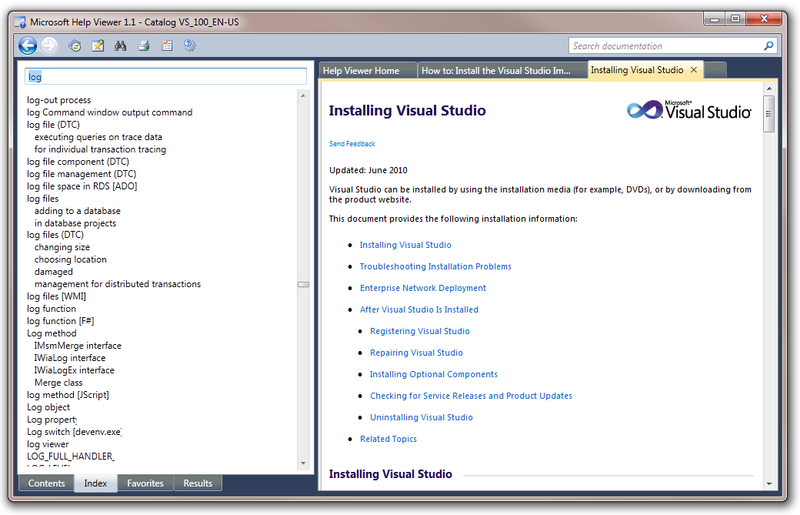 Visual Studio 6.0 shipped. Contains VB 6.0, VC++ 6.0 etc. MSDN is again HTML Help based. 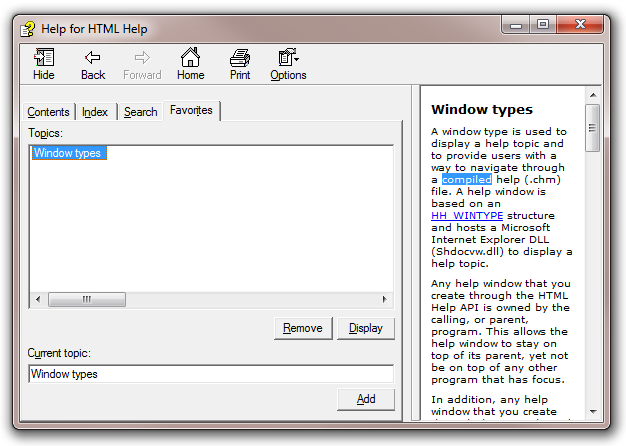 Includes HTML Help 1.30 + IE5.01. Windows ME (Millennium) Edition shipped. Includes HTML Help 1.32 + IE5.5. Includes HTML Help 1.33 + IE6.0. Visual Studio .NET (7.0, 2002) shipped. Introduces managed code via the .NET Framework, and C#, J# and VB .NET. MSDN help engine = MS Help 2.1. Visual Studio .NET 2003 (7.1) shipped. Includes .NET Framework 1.1. MSDN help engine = MS Help 2.2. 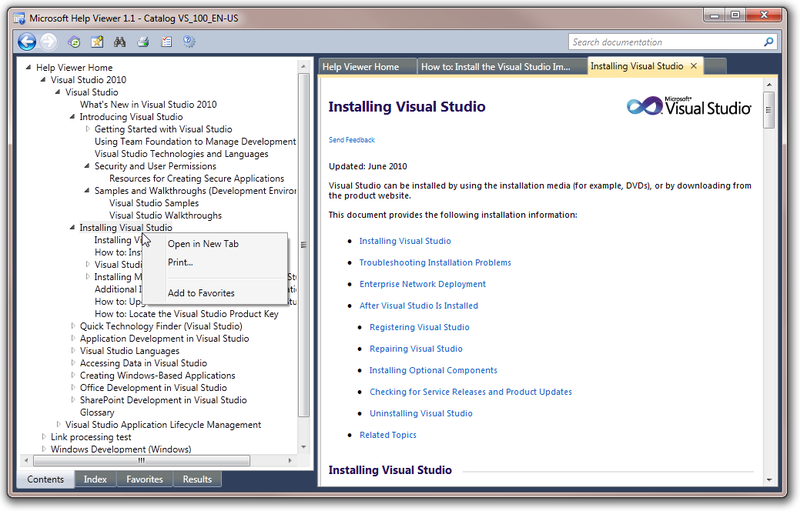 Visual Studio 2005 (8.0) shipped. Includes .NET Framework 2.0. MSDN help engine = MS Help 2.5. Windows Vista ships. Released to manufacturing (RTM) in November 2006. Microsoft have lost a lot of time addressing security related issues. The release lacks any real benefit to customers. AP Help 1.0 is the help system for Vista. MSDN help engine = MS Help 2.x. Windows 7 - Finally adds the finish and features that Vista should have had. New glass Taskbar and Multi-Touch support. AP Help 1.x is the help system for Windows 7 ?. Help Viewer 1.0 ships with VS 2010. Help Viewer 1.1 ships with VS 2010 SP1. Help Viewer 2 ships with VS 2012. Help Viewer 2 ships with Windows 8 OS. Microsoft Advisor engine being used in Quick Basic. Probably running in a DOS box under Windows or OS/2. These [screen captures] came from Microsoft Excel 2.0, which appears to be the only place I know of where this shipped. It is copyrighted from 1987 and is very limited in functionality, at least from the UI itself. As you can see, it is actually labeled Microsoft Excel Help 2.0. An interesting aspect of how this shipped is that the viewer and the content shipped as one file - excel.hlp. In other words, the .hlp file was an executable - the viewer, and the help content was included as part of that as well. Looking at the file in a hex view, it appears to have worked more natively with RTF content as many rtf tokens can be seen throughout the file. Functionally, it supported Next, Previous, Back and Index, where Index meant something more like Home page or table of contents. If there was keyword lookup support, it was only supported via F1 - no UI. It supported popups, but they functioned differently - you have to either hold the Enter key down when the popup link is selected, or hold the mouse button down. Once the Enter key or mouse button are released the popup disappears. These [screen captures] came from Winword 1.0, which is also the only place I know of where this shipped. It is copyrighted from 1989 and has a bit more features added. It is labeled Microsoft Help 2.50 and separated the viewer from the content. The viewer was WHELP.EXE, which does not appear to have a command-line interface that I've been able to determine. The viewer needs to be launched by the application with the help file to show. Functionally, it supported the same as the 2.0 viewer, but added a visible keyword index UI and a disambiguator for when there are more than one topic with the same keyword. It also added support for Bookmarks (favorites). Popup support is the same as the 2.0 version. Rob: Source is simply ANSI encoded HTML pages (WinHelp was RTF based) compiled to a proprietary format .chm file using a free HTML Help Workshop tool. As with WinHelp there was no registration required. Just double-click the .chm file to viewer it. As with WinHelp .CHMs can be designed to merge together at run-time. Index is the familiar word wheel format. As you type text the list scrolls to the matching text. Search results is directly under the search button ("List Topics"). Select a result and hit "Display" or just double-click the result item to display. The search results show "topic title" + "title of CHM module" + "Rank" (original search ranking order as initially produced by the search engine). Favorites are nice in that you can choose your own title (topic title is the default). Rob: Help shows in the default browser. There is a lightweight TOC, no index, no ability to save bookmarks or print multiple pages or filter. Parameters embedded in the URL control what content to display. The last parameter "embedded=true" controls the display of the navigation side panel. The help system has a kick-arse engine and API, however the light weight User Interface (help in a browser) is not well received by the public. 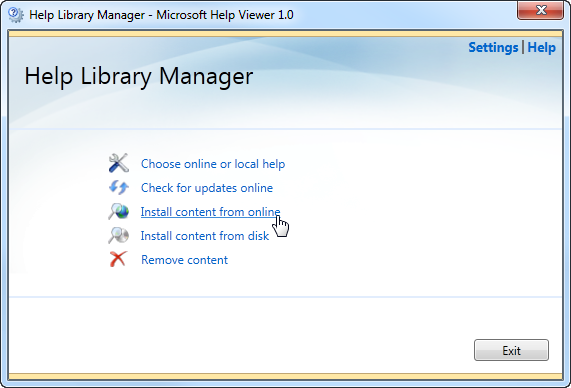 A new application called "Help Library Manager" is used to download and install local MSDN help content. The Help engine (Help Library Agent - HelpLibAgent.exe) runs in the system tray. It's job is to watch for any local URLs that are directed at the Help Viewer 1.x help system and fetch help content from the local help store (a central area where all registered .mshc help files are stored) to the browser applications requesting the info. Rob: Due to customer response to HV 1.0, Microsoft return to a standard help viewer experience. Now with full TOC, full Index, bookmark saving. Filters are still missing which is a problem when dealing with a million topics. Some suggest to install just what you need, but past releases have encouraged most users to install everything (old habits a hard to break). Multi-page print is still missing. The Index (like the TOC) is very smart and loads into memory only what is in view. A similar experience to MS Help 2.x (VS 200x help) Index. There is history (past pages visited) available on the favorites page. Favorites just store the title text, with no information about what book or area it is part of. Note that even if you do "Properties" on a topic page all you get really is a GUID and some inhouse keywords and version numbers. An options dialog provides some basic "most requested" settings. There is no traditional menu bar. Search results are displayed in the Results tab. Along with the topic title is an a brief description (as defined in the topics "Description" meta tag). And under the description is the category the document belongs to. There are only a hand full of category names predefined (hardwired) so more often than not we wont know where the help comes from. Help Viewer has no concept of a "book" (or sub container). Once a .mshc file is installed, the content topics basically become just another topic in a vast collection of topics. Only visually in the TOC (if the page exists in the TOC) and possibly a few hyper links, can you see any relationship between topics. The Help Content Manager for adding/removing content is now built-in (an extra tab). A little complex (too much happening at once), but works for the developer audience. Windows 8 Help. No surprises visually. No hierarchical TOC or Index. Browsing lists and Search. Offline & Online mode.